Unripe green tomatoes (not the heirloom variety) usually appear toward the end of tomato season, in early fall. Tomatoes that remain in abundance on the vines but may not get a chance to ripen are picked green before the cold weather sets in. I buy green tomatoes every year at least once, just for the pleasure of seizing the fleeting moment. I have made green tomato jam, which I remember from my childhood; I have improvised fried green tomatoes, after seeing the movie; this year I decided to make green tomato chutney. This recipe is compiled from examples I found in a couple of my cookbooks and online. Coarsely chop tomatoes and apples, finely chop onions, and very finely chop lemon (with rind) and ginger (without peel). Place all in a large, heavy-bottom saucepan. Add raisins, cayenne, salt, sugar, and vinegar. Mix. Slowly bring to a boil then simmer over low heat for at least 2 hours, stirring occasionally to prevent sticking to the pan, until the chutney has thickened. Sterilize jars in boiling water for 5 to 10 minutes. Pour hot chutney into sterilized jars and close immediately. Wait for a few weeks as chutney needs to mature. 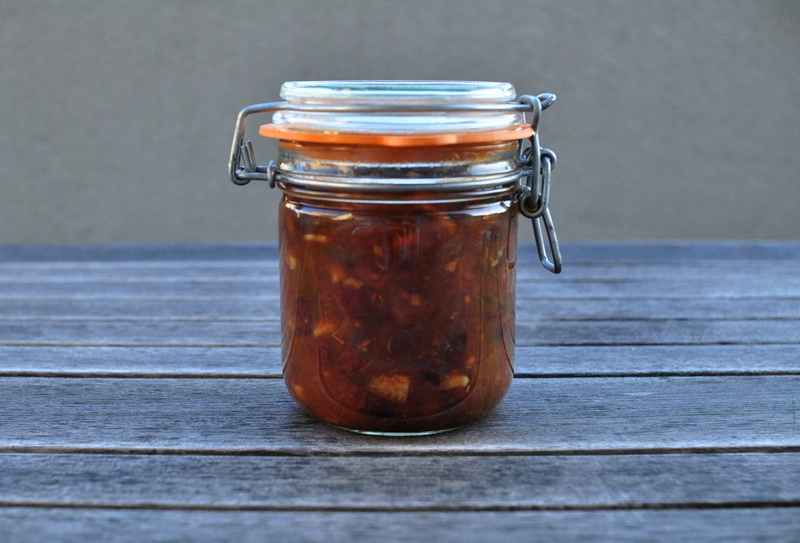 This entry was posted on 6 October 2010 at 12:11 and is filed under Fall, Homemade and preserves. You can follow any responses to this entry through the RSS 2.0 feed. You can skip to the end and leave a response. Pinging is currently not allowed. I completely share your urge to buy green tomatoes. I used to make green tomatoe jam with my grand mother and it is one if my fondest childhood memories…. Question for you though – what would you pair this loveliness with? I was thinking of pairings for the chutney and I’m stuck on two flavor combinations: aged Gruyere or a hardy white fish like halibut. The chutney is quite lemony and a bit spicy, I think these would go well with it. ERRATA: Does not pair well with Gruyere, the flavors cancel each other out. Still need to try with fish. Roast chicken is the way to go, definitely! Goes very well with roast chicken. Hot and cold. Hope there will be some left when I come to NYC!